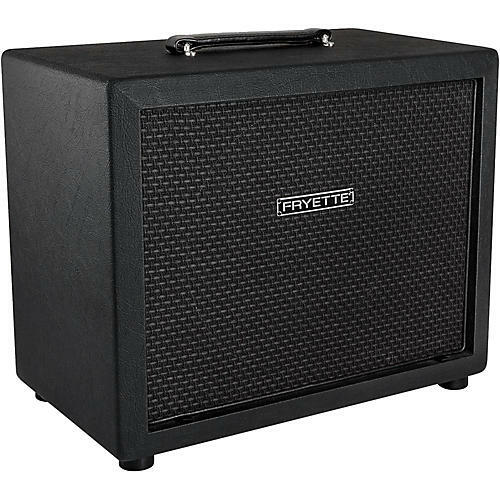 The 70-watt Fryette Deliverance 112 cabinet is a compact ported 1X12 speaker cab with a vertical baffle that is front loaded with an 8 Ohm U.K.-made Fane-Acoustics F70G driver. This specially tuned cabinet is designed to be used as a compact alternative to a 212 or 412. You can comfortably push it with anything from a few watts to 50 while achieving warm balanced tone and definition. The Fane F70G driver handles low end with ease and will never get mushy or tubby. Deliverance Series Speaker systems feature high-quality Baltic birch materials, manufactured on CNC cutting equipment for accurate assembly and bullet-proof construction. The 12 inch speaker is front-mounted for wide dispersion, plus there are 4 ports on the baffle, producing a full, extended low end response. The specialized tuning of this cabinet produces a somewhat loose “old-school” feel with a pleasing omni-directional dispersion quality, while maintaining excellent low end response and power handling capacity. Comes with a FANE F70G 12” speaker, Made in the U.K.
Dimensions: 20 x 12 x 16 in.